Alternative meeting and presentation spaces are in demand, as companies large and small embrace new ways of working. The Waiwai Collective on University Avenue offers the usual co-working amenities like coffee, varied workspaces, and fast wifi. At Waiwai, a core of values-aligned non-profits helps subsidize monthly memberships, which start at $10/month for students. 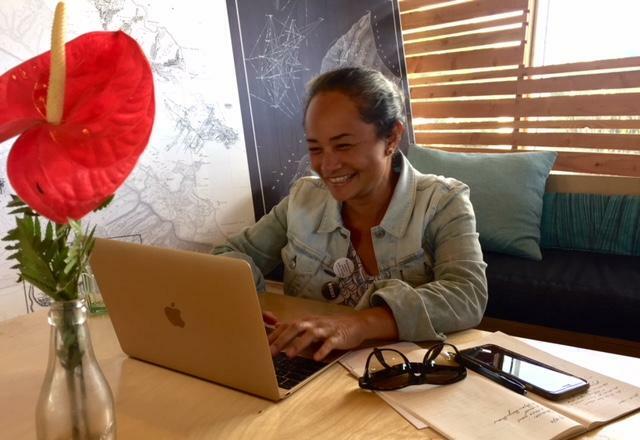 Mahina Paishon-Duarte, formerly head of Paepae o He'eia, formerly head of Halau Ku Mana Charter School, now Head of School at Kanu o ka Aina, and co-founder of Waiwai Collective. A visit to the Waiwai Collective on University Avenue. 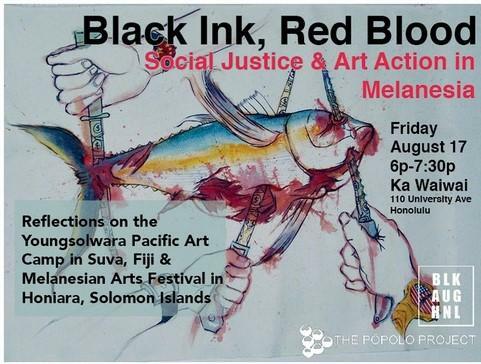 The Waiwai Collective hosts reflections on art and social justice in Melanesia this Thursday night, 6-7:30, August 17, 2018. This co-working space has been open since October 2017. Formerly a Bank of Hawai‘i, the interior sports a small cafe, and individual desks and work spaces during the day, and can transform for large group gatherings. There is a small private room (the former vault,) and parking is free on the ma kai side after 5pm. On a recent Friday night at Ka Waiwai, it was great to find free parking, a friendly vibe, and Kamana Beamer and Kaliko Maii playing music! Kids were scattered in front of the stage, someone was getting lomilomi massage, the ‘awa was flowing. "You come in the door, first thing you do, you take off your slippers. You’re greeted by a kuahu, so you know that when you enter, there is a certain expectation and that we’re holding sacred space." Ka Waiwai offers live music Thursday, Friday and Saturday nights with a $5 cover. Homey vibe, casual family scene, on this Friday night, it was Kamana Beamer, vocals and guitar, and Kaliko Mai'i on bass. Awa is $5 a cup but the $15 unlimited is the way to go. The pupu platter was delicious. 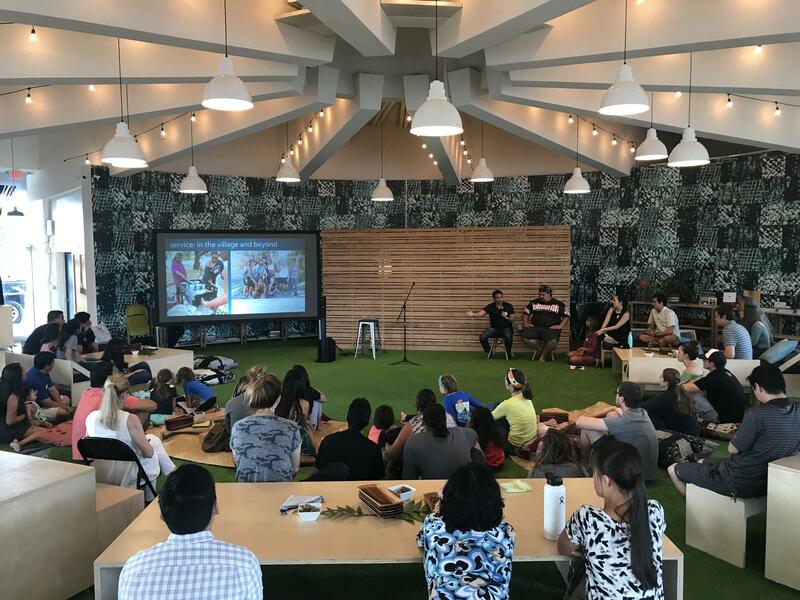 Mahina Paishon-Duarte is a co-founder of the Waiwai Collective, a co-working hub in the former Bank of Hawai‘i at Varsity. An educator, currently Head of School at Kanu o ka ‘Aina public charter school, Paishon-Duarte says a kuahu is a physical symbol of our commitment to a higher purpose. Paishon-Duarte: Our highest purpose is collective values. We offer this space not only for Hawaiian=s but for all people who want to steward Hawai‘i and take care of her. Keoni Lee is a co-founder of ‘Ōiwi TV and a co-founder of Ka Waiwai. 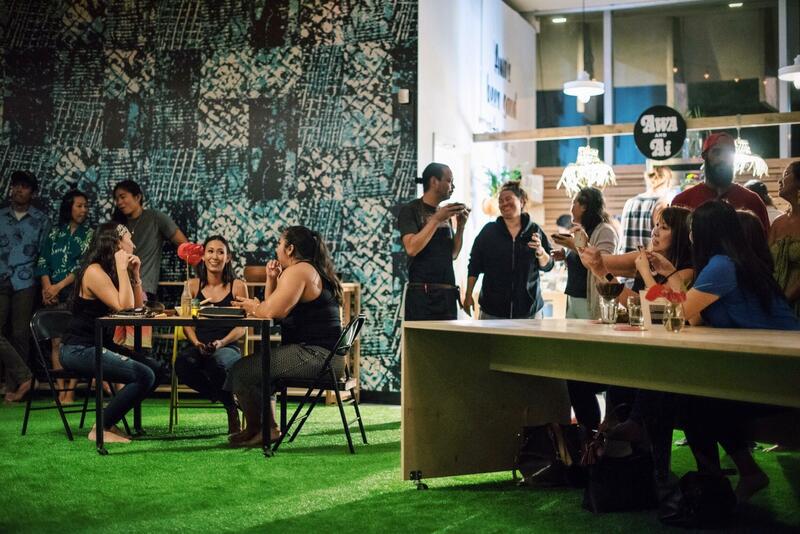 The idea for this community gathering space came about during the 2016 election season. Lee: The work at ‘Ōiwi TV, being online in media an dseeign wehat wa happening to the conversation onine socially, it was crazy. The vitriol, the hatred, the division, the polarisztion, it’s a sign of the times. People are able to affirm whatever extreme positions they have and not have actual dialog. Waiwai Collective co-founder Keoni Lee is also one of the co-founders of 'Oiwi TV, the premier purveyor of Hawai'i content in video. He had worked with another co-founder, Jamie Makasobe, on media projects, and was on the board of Halau Ku Mana, Paishon-Duarte's school. Connections are many between these three, who claim Ka Waiwai is an excuse to work together. Paishon-Duarte: And once you care, you want to be accountable. You enter in to a mutual social contract where you want to o be accountable and responsible not only to one another but to perhaps a greater vision that transcends and particular individual interests. 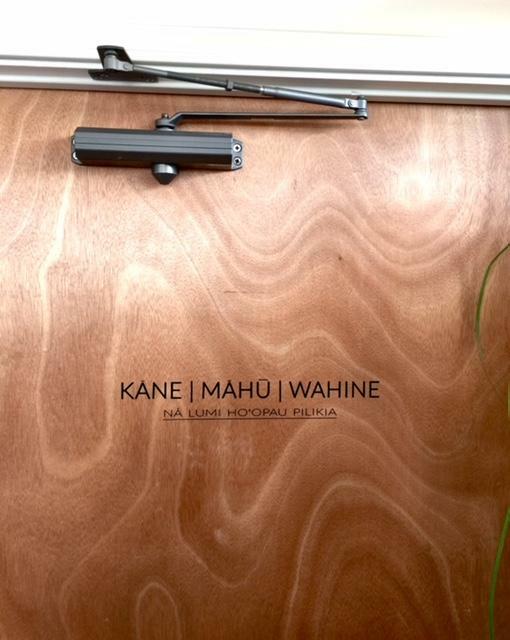 Lee and Paishon-Duarte teamed up with the co-founder of Kealopiko eco-fashion, Jamie Makasobe---who designed their space in the circular building. Paishon-Duarte: Who would have thought? Astroturf and big colorful pillows, create magic. It unguards everyone. Lee: Really the key, the secret sauce, is the programming. People can propose events, like health workshops, or themed networking events. The café serves ‘awa and local healthy treats. More evidence of values aligned partnerships. Local non-profits form a base of support, in exchange for use of the facility, thus helping subsidize memberships. Like health clubs, and other co-working hubs, members pay monthly dues for their desired level of use. 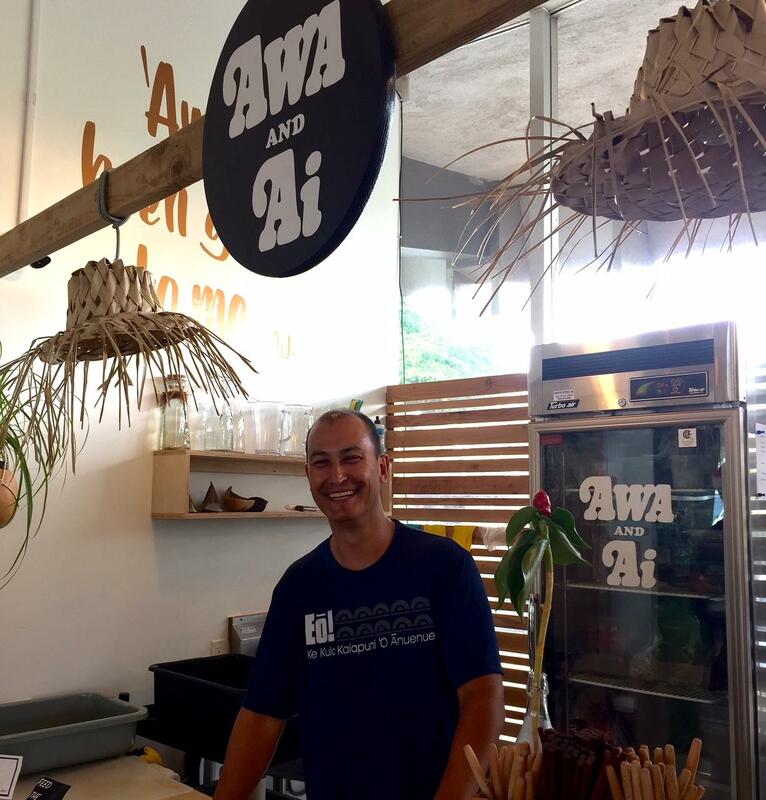 Ka Waiwai offers fast wifi, meeting spaces, and business services and a café serving ‘awa and locally sourced treats. The pūpū platter last week was delicious: dried aku, cubes of uala and taro, and a fern shoot salad. Partner chefs are Mark Noguchi, Ed Kenney, Kealoha Domingo, and others whose sourcing and perspectives are, again, values-aligned. Lee says, their suppliers, vendors, members, all create a "full value chain" of shared aspiration. Paishon-Duarte: We can experience the change we want to create. Open since October 2017, their lease runs through 2019. Back about 7 years ago, Rechung Fujihira co-founded Honolulu’s first co-working hub. "My friend Tony and I had this idea of creating an airport lounge outside of an airport. Then when we started doing some research we realized there was this thing called co-working growing. So we went out to New York to meet the godfather of co-working, and he was, like, Yo, you can do it." We’ll pop by Box Jelly later this week.